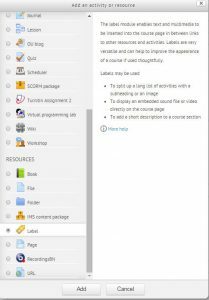 Labels are a great way to quickly organize content on your Moodle site or course. They can also be used as Heading titles, and can contain images and formatted text. 1. To create a label, first turn editing on. 2. In the topic/section of your choosing, select Add an activity or Resource from the drop down menu, and select Label. 3. The Label text is where all content will go for this label. Remember, less is more for this resource. To add greater amounts of content, consider using a Page or Book. To see all available tools, click the expansion icon. From here, you will be able to add audio, video, images, HTML, or simple text. 4. 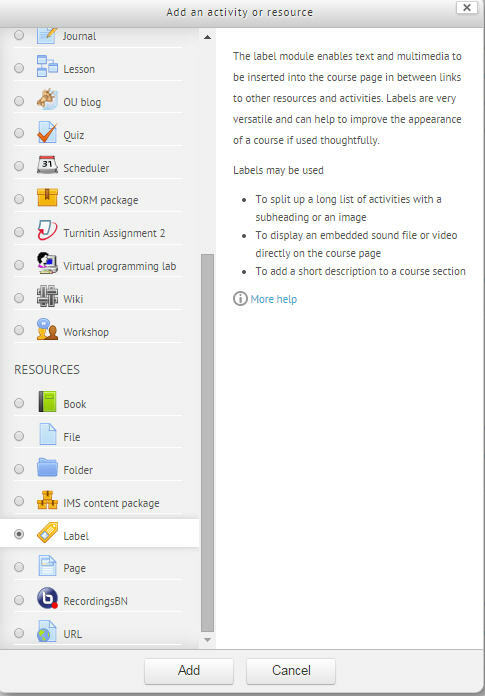 When you are satisfied, click Save and return to course to view the label in the course.